White tigers are Bengal tigers of mixed Bengal/Amur ancestry with pink noses, white-to-creme colored fur and black, grey, or chocolate colored stripes. Their eyes are usually light blue, but may be green or amber. 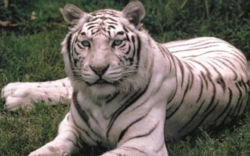 There are several hundred captive white tiger worldwide, all of whom can trace their ancestry back to a single White Bengal tiger caught in Rewa, India. White tigers are formed exclusively from inbreeding-usually between parents and cubs. Such inbreeding may often lead to birth defects, the wide appeal of the White Tiger has lead to inbreeding as a regular practice among people. White tigers are not a separate species from the Bengal tiger but are simply a different variety. White tigers have become popular attraction in zoos and entertainment that showcases exotic animals because of their amazing combination of spectacular beauty and impressing power. White tiger cub that just arrived in the Memphis Zoo. The white tiger (also known as the Bengal tiger) is about 3 meters long, and weighs approximately 400-569 pounds. Their stripes are like fingerprints. No two are the same. The stripes are not only in the tigers fur, but are a pigmentation of the skin. They have a white spot on the back of their ears, which looks like eyes. It's coat lies flatter than that of the Siberian tiger, the tawny color is richer and the stripes are darker. They are one of the only two species of cats that like water. At full running speed they reach speeds up to about 60 kilometer per hour. Although they do not produce great stamina. The average tiger sleeps between 16 to 18 hours. The ability of big cats to roar is related to the arrangement of bones under the tongue. Also the stripes on its body helps its ability to hide in the tall grass and trees. Bengal tiger has a strong sense of smell. They also have great vision which helps them to hunt during the night time. White Bengal tigers can also swim and move quite swiftly in the water. They have the ability to shed or grow body hair according to how cold or hot it gets. Mating can occur at any time, but happens to be usually between November and April. The females can have cubs at the age of 3-4 years old; males reach maturity at about 4 years. After the gestation period of 103 days, 2-5 cubs are born. Newborn white Bengal tiger cubs weigh about 2.2 pounds and are blind and helpless. The mother feeds them milk for about 6-8 weeks and then the cubs are introduced to meat. Cubs of Bengal Tigers depend on the mother for 1.5 years and then they start hunting on their own. The size of a tiger's territory depends on the amount of food available, and usually ranges from about 10 to 30 square miles (26-78 sq. km). Siberian tigers sometimes have really big territories (as large as 120 square miles). Although tigers usually live alone, tiger territories can overlap. A male tiger's territory usually overlaps those of several female tigers. Today only about 5,000–7,000 wild tigers live across Asia. The northernmost living tiger, the Amur or Siberian tiger, lives primarily in southeastern Russia. The South China tiger occurs only in southern China. The range of the Indochinese tiger extends across most of Southeast Asia. The Bengal tiger is found primarily in India, while the Sumatran tiger is restricted to the Indonesian island of Sumatra. The Bali, Caspian, and Javan tigers have become extinct in the past 70 years. Tigers live in Asia, mainly from India to China and in Southeast Asia. Tigers usually live in the forest and rainforests. They also like to live under bushes and around where there is plenty of food for them to hunt and hide. Over much of the tiger's broad range, wild pig, wild cattle and several species of deer are its major prey. All prey are forest or grassland animals that range in size from 65 to 2,000 pounds. Typically, wild tigers gorge themselves on fresh kills, and can eat as much as 40 pounds of meat at one time. The tiger will not eat again for several days. White Bengal tiger swimming at the Singapore zoo. Baby white bengal tiger laying in the grass. This page was last modified on 7 March 2014, at 15:47.